Want to get your hands on Microsoft's new Zune HD? You may soon be able to pre-order the device from Amazon, and it could cost significantly less than the iPod Touch. The online retailer has launched a pre-order Web page for the Zune HD, which says the 16GB model will come in black and sell for $220; and the 32GB version, in platinum, will cost $290. For the moment Amazon's pre-order page is static, and returns an error when you try to click through and purchase the device. Unless Amazon revises or pulls the page, I would expect these prices to remain accurate since Best Buy's Zune HD price leak reported by Gizmodo yesterday reflects similar pricing. If these price points are correct, the Zune HD significantly beats out the iPod Touch on cost by $79 and $109 respectively -- the 16GB iPod Touch is $299 and the 32GB version is $399. That's a pretty big price difference, especially since, feature-for-feature, the Zune HD and iPod Touch are very similar. Both devices have touchscreens, Wi-Fi, and HD video out support (the iPod touch displays 480p and 576p; Zune HD has 720p). According to Amazon's pre-order page, the Zune HD will play games just like the iPod Touch does, but it's not clear yet how advanced Zune HD's gaming capabilities will be. The Zune HD also has an HD radio receiver and will be able to stream music over Wi-Fi -- things the iPod Touch cannot do out of the box. But Zune HD may not have the upper hand for long since Apple typically announces changes to its iPod lineup in the fall. Last year, for example, Cupertino launched a refreshed iPod Nano on September 9. So it's possible Cupertino could drop the price of the iPod Touch by the time the Zune HD launches. There's no official word on a Zune HD release date yet, but the current rumors suggest a September 8 launch. That's less than a month away, so it wouldn't be surprising -- but by no means guaranteed -- to see Amazon accepting pre-orders relatively soon. 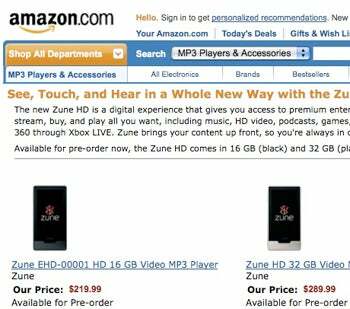 This story, "Amazon Leaks Zune HD Pricing" was originally published by PCWorld.